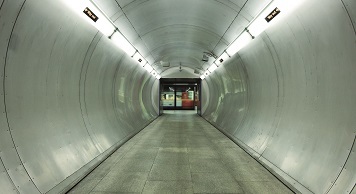 A new partnership has been established between London South Bank University (LSBU), London Underground Ltd (LUL), and Islington Council that should make a vital contribution to cutting carbon emissions while keeping the capital’s commuters cool at the same time. “We’ve been working on cooling London Underground for a number of years and one recent study involved working at York Road Station near Islington. The heat removed by cooling the Underground is usually exhausted to the outside air and wasted,” explains Dr Gareth Davies, Senior Research Fellow in the Centre for Refrigeration and Air Conditioning. There are two key issues affecting London’s Underground tube system: the fact that it generates a lot of heat that is currently not recovered; and the fact that this waste heat can contribute to the overheating of tube carriages, making travel uncomfortable for passengers. There are two key issues affecting London’s Underground tube system: the fact that it generates a lot of heat that is currently not recovered; and the fact that this waste heat can contribute to the overheating of tube carriages, making travel uncomfortable for passengers. The existing partnership with LUL and the idea for reusing the heat from York Road Station led to a project called Metropolitan Integrated Cooling and Heating (MICAH). MICAH was established to determine the feasibility of transferring waste heat from London Underground to Islington Borough Council’s district heating network, thereby providing a low carbon heating and cooling solution. It involves the transfer of the heat generated in the Underground to where there is demand for heat, and in doing so provides cooling for LUL. “MICAH is definitely an important, low carbon, environmentally friendly way of providing heat,” says Dr Graeme Maidment, Professor of Refrigeration and Air Conditioning. “Currently, heat constitutes 47 percent of all end use energy demand, while cooling accounts for 19 percent of all electricity use. Alongside other global environmental challenges, reducing heating and cooling energy use is therefore a high priority. The feasibility study funded by Innovate UK will investigate the technical viability and business case of using LUL’s heat exchanger at York Road Station to transfer heat to Islington Borough Council’s district heating network. Combining the two systems should reduce the energy required by both parties. “As well as looking at how it might work technically, there are also some key non-technical barriers for this project,” says Professor Maidment. “Issues such as how a scheme might work commercially, who is commercially responsible for what and how commercial transactions might take place need to be assessed. With this in mind, the partnership is currently applying for funding for a demonstration project, alongside a funding stream via Innovate UK to progress initial feasibility studies. The project is pioneering the repurposing of waste heat generated by the underground tube system as a potent resource for improving London’s energy efficiency and cutting carbon emissions. Although a new project (it started in 2016), the partnership has already had two papers accepted for conferences, and the team has also been invited to run a workshop on the concept in Ireland. A breakfast briefing with London Underground was presented at the Houses of Parliament.